Tekkaman the Space Knight is an anime TV series produced by Tatsunoko Production. Set in the distant future of the 21st century, the Earth is polluted and nearly depleted of resources. Mankind is forced to find a new home which they dub "Second Earth". But just as they are set to launch the mission, the evil alien alliance known as the Waldastar attack to impede their efforts. After his father is killed in the first Waldastar attack, Jouji Minami hijacks the highly advanced robot Pegas. 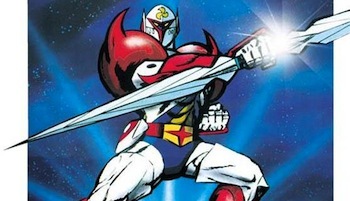 Using the robot's built in "Tek-Set" system, he transforms into the armored Space Knight, Tekkaman. Together with his girlfriend Hiromi and the mysterious Andro Umeda, the three of them search for a new world while fending off the Waldarian menace. Dubbed in English by William Winckler Productions, the series is better known in America for its almost Adam West-like tone than Japan's version. The original series is legally available to watch on Anime Sols, where you can also pledge money to keep the series afloat in the United States and Canada in exchange for physical goods, such as stickers, posters and DVD box sets. However, the first DVD box set was unable to meet its funding goal, and as a result, no further episodes are being uploaded. Alien Invaders: The Waldarians and their mutant creations, complete with flying saucers. Blade on a Stick: Tekkaman's Tek Lancer, known as the Space Lance! in the dub. Bowdlerization: The dub, according to William Winckler himself in this interview . To be fair, as few cuts as possible were made to the action scenes, with most of the censorship occurring in the dialogue (Tekkaman "deactivating" the robots, for instance). Captain Obvious: Tekkaman in the dub. Cut Short: The show was meant to be a 52-episode series. The show's original Japanese airing was a complete ratings failure however, and resulted the show to be cut down to 26. Also applies to English version, in which only 13 of those 26 episodes were dubbed. William Winckler wanted to dub the rest of the series, but the lack of a toyline or a network picking the series up caused that idea to fizzle out. Evil Knockoff: The Waldarians steal blueprints and make an evil Tekkaman in one episode, though the original Tekkaman and Pegas note the poor construction. Freeze Ray: "Oh no! A Freeze Ray!" Lull Destruction: In Japanese, Tekkaman is pretty much The Quiet One. This didn't quite stick in the dub. No Indoor Voice: Dub!Tekkaman isn't content with just stating the obvious all the time. He also has to say it as loudly as possible. Power at a Price: The Tek-Set system is a tremendous strain on the user. Never mind that the transformation is painful, Jouji is more often than not completely exhausted after every battle, doubly so if he uses the Voltekka. No wonder why Hiromi is constantly worried sick whenever he goes out to fight. Ridiculously Cute Critter: Mutan, who actually proves quite useful. Robo Speak: Pegas in the dub. Sacrificial Lamb: The robot army in episode 13 give up their lives by using their circuits to form a bomb to free Pegas from a trap. Shapeshifter: Various Waldestar underlings and occasionally Rambos himself. Status Quo Is God: Meta example. Only the first 13 episodes were dubbed when the series aired on American TV in the mid-1980s. The Anime Sols release was only able to make it to episode 13 before the first DVD boxset passed its deadline without being funded. As a result, anyone who saw the English dub and wanted to get the original Japanese version on DVD are no closer to seeing the rest of the series then they were when the dub first aired. Whip It Good: The Tek Win, also known as the Space Lariat! in the dub.